SOLD OUT -- LIMITED NUMBER OF STANDING ROOM ONLY TICKETS AVAILABLE AT THE DOOR BEFORE SHOW! 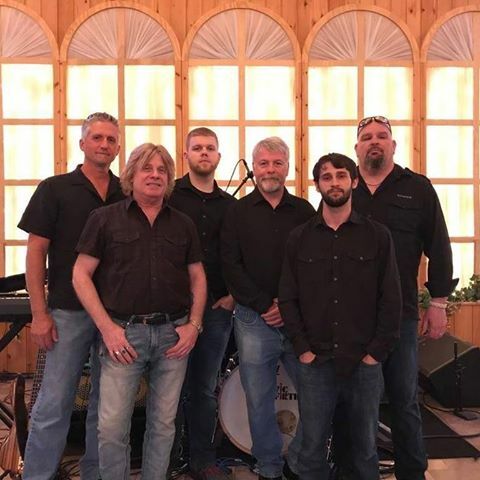 The six members of 7 Bridges Road, from Western Massachusetts, are some of that area’s finest vocalists and musicians, and have come together to present the body of work that is the legacy of America’s premier vocal rock band, the Eagles. Each selection is lovingly and painstakingly arranged and rehearsed, and the resulting show is a treat both for fans of the Eagles and for fans of good music played exceptionally well. Along with the music, members of the band relate interesting stories about the songs and the members of the Eagles and their influences, all while presenting a highly entertaining and exciting show, which includes numbers from the ‘70’s and ‘80’s as well as from the “new” album, released in 2006. 7BR also includes some of the releases from individual Eagles members’ solo careers. With five vocalists, three guitarists, keyboards, bass and drums, everything you’d expect to hear in an Eagles song is right there – live and well executed – the intricate vocal arrangements, the double guitar work, the great rhythm section. It’s all there, and leaves the audience singing on their way out at the end of each show. Tickets to see this incredible performance at 41 Bridge Street Live are $23 for General Admission and $30 for VIP tickets (plus fees).